Allegan State Game Area is best done during the off-season—either in early May when fiddleheads are popping through the forest floor and the flowering dogwood is in full bloom, or in the fall, when one can witness one of the largest migratory gatherings of waterfowl in the state. In mid-July, you’ll find the wildlife scarce, the fishing slow, and the mosquitoes and black flies ferocious. The state game area is a 50,000-acre wildlife preserve created in 1946 by combining several tracts of public land. It includes parts of seven lakes, bogs and large marshes, open meadows, and oak, maple, and pine forests that cover the sand plains of west-central Allegan County. It’s managed primarily for waterfowl, and during the fall migration, 75,000 to 100,000 Canada geese alone stop in the game area to rest for a week or two before continuing their flight south. 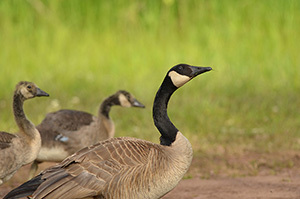 Peak migration traditionally occurs from November 1 to 15, when as many as 30,000 geese may be in the preserve at one time. It’s an impressive sight and a lot of honking. But spread across the game area are almost 30 miles of foot trails with the heart of the system centered around Swan Creek and separated by the 118th Avenue dam. To the north is the 5.2-mile North Swan Creek Loop that follows loop the creek to the edge of Koopman Marsh. This stretch attracts steelheaders. For hikers, however, the much more scenic route is the South Swan Creek Loop, where a 5.8-mile trail skirts Swan Creek Pond and then the creek to 116th Avenue. A delightful system of short trails is centered around the Ely Lake Campground while connecting the Allegan County campground and the Swan Creek hiking trails is the Wakazoo Trail, also referred to as the Northwest Trail. This 14-mile loop, one of the longest trails in southwest Michigan, is a relatively flat route that at times skirts equestrian trails and crosses forested two-tracks.